White House Press Secretary Josh Earnest said that 805,000 manufacturing jobs have been created since President Barack Obama has been in office. 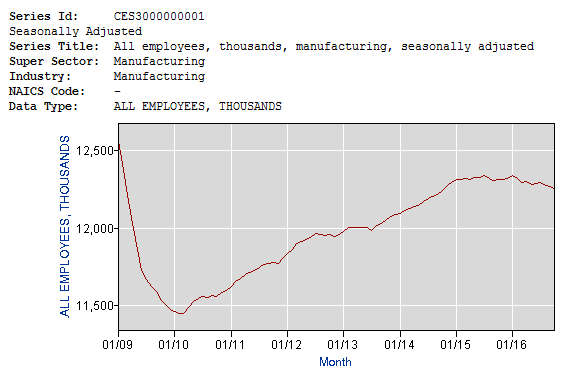 In fact, there has been a net loss of 303,000 manufacturing jobs since January 2009. Earnest called the announcement “good news,” but claimed that Trump would have to make another 804 deals like that to equal the number of manufacturing jobs created while Obama has been president. Earnest, Nov. 30: Well, you know, obviously we haven’t seen the details of the announcement from the company, but you know we’ll obviously – the early indications are that this is good news. I know that the President-elect has indicated that he deserves credit for that announcement. And I guess what I would observe is that if he is successful in doing that 804 more times, then he will meet the record of manufacturing jobs that were created in the United States while President Obama was in office. There were 805,000 manufacturing jobs that weren’t just protected or saved, but actually created while President Obama was in office. So President Obama has set a high standard, and President-elect Trump can meet that standard if this Carrier deal is completed in the way that he expects that it will be. If he does that 804 more times, then he will have matched the standard established by President Obama — at least when it comes to manufacturing jobs. As Earnest noted, there is a difference between a job that is created and a job that is saved. But there are also jobs that are lost — which Earnest ignores. The president’s press secretary comes up with 805,000 by counting job growth since February 2010, which was the low point for manufacturing jobs in the U.S. following the Great Recession from December 2007 to June 2009. The administration frequently uses February 2010 as a start date when calculating manufacturing jobs, as it did on Aug. 8 to announce Manufacturing Day. But Obama was president long before February 2010. Manufacturing employment was 12,258,000 in October 2016, according to the most recent estimates from the U.S. Bureau of Labor Statistics. That’s down 303,000 from the number employed in January 2009, the same month that Obama was sworn in as president. To make his point, Earnest just ignored all of the job losses that occurred during the first 13 months of Obama’s presidency.